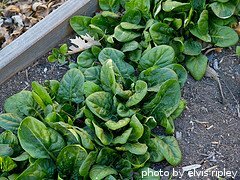 The time to think about fertilizing spinach is before you even plant it. Mixing in a nitrogen-rich fertilizer into the soil before planting will result in much higher yields. When it comes to watering spinach, consistency is the name of the game, as the plants grow best in perpetually moist soil. Keeping the soil most is important when growing spinach. This serves two purposes - it allows the plants to absorb moisture from the soil and it also serves to cool down the soil. Spinach plants tend to bolt quickly in hot weather. When this happens, the leaves become nearly inedible fairly quickly. By keeping the soil moist and cool, you can prolong the harvest season, giving you more spinach leaves to pick. Spinach does best with 1-1.5 inches of rain per week. If you don't get any rain, you'll need to water the plants yourself. They do much better with 3-4 light soakings per week, as opposed to one long deep soak. The roots don't run very deep and they aren't very efficient at extracting moisture that isn't close to the surface of the soil. On the other hand, if the soil stays soggy for extended periods of time, the plants won't do well either. The idea here is to keep the surface soil consistently damp. A good way to keep the soil moist and cool is to apply mulch. 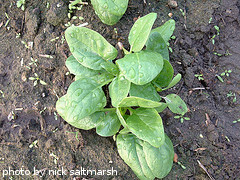 Spinach plants don't get very tall, so it can be impractical to mulch right up to the base of the plant. However, a layer of mulch applied on each side of the row can do wonders to help the soil retain moisture. Grass clippings, straw and chopped up leaves all work well as mulch. Before planting, we suggest working a combination of compost and a balanced fertilizer into the soil. We like to do this a few days before planting the seeds, so the fertilizer has a chance to break down a little bit. If you want to grow organically, use fish emulsion or well-rotted manure as soil additives before you plant. 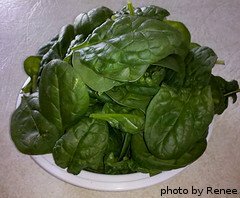 A balanced fertilizer works fine for spinach, but something with a bit more nitrogen also works well. Something like 10-10-10 will get the job done. When choosing a fertilizer, pay attention to the three number code on the package. These numbers indicate the percentage of nitrogen, phosphate and potassium that are contained in that particular bag, respectively. We mix in a balanced granular fertilizer before planting, and then use a water-soluble fertilizer every 2 weeks or so while the plants are growing. This way, the plants get off to a great start and then we're able to save time by watering and fertilizing them at the same time. We fertilize spinach about every 2-3 weeks during the growing season. If you want to use a granular fertilizer while the plants are growing, use it as a side dressing along the edge of the row and apply it once every month or so. Pay attention and avoid letting the granules come in contact with the plants, as it will burn them. After applying a granule fertilizer, water it in well immediately. If you want to grow organically, you can side dress with any organic fertilizer that is rich in nitrogen. Plant and manure-based composts work well and can be applied once or twice during the growing season. In addition, any balanced or nitrogen-rich organic fertilizer that is water-soluble will also work fine.